Solar energy is an intermittent, renewable source of power that is captured in a variety of ways when the sun is shining. There are several different applications for solar energy; a few examples found in Idaho include: remote-facility electrification, lighting, communications, powering monitoring devices, warning signs, water pumping and cathodic protection. The largest use of solar energy in Idaho is to provide electricity; this is done both at the individual or residential level and utility-scale. Utility-scale solar power generation – or power developed for retail use – in Idaho began in August 2016. At the end of 2016, solar energy produced about 0.2% of the total megawatt hours generated in Idaho. By the end of 2017, it is estimated that 3% of Idaho’s total megawatt hours generated came from solar energy. There are a few different technologies used to capture solar energy for consumption. Either photovoltaic (PV) solar cells or concentrated solar power (CSP) can be used to absorb the sun’s energy and produce heat. PV solar cells convert sunlight by using solar plates stationed on an array that is angled towards the sun. CSP technologies concentrate reflected sunlight off of mirrors onto receivers that converts that light into heat that is warming either air or liquid. This process generates energy which is then used to make electricity. A third use of solar energy is in solar water heating or thermal systems. These systems are generally used to heat buildings by using a series of pumps to transfer heated fluid through pipes in the building. There are two types of water heating systems, active and passive. Active systems circulate liquid, either water or anti-freezing heat-transfer fluid, through a series of pumps and controls located in pipes. Passive systems use the movement of hot water rising and cool water sinking to push water through a pipe system without the use of pumps. Both systems use a storage tank and solar panels to collect the needed heat. The images below demonstrate an example of each type of system previously described. The Department of Energy keeps a map of solar potential in the United States. To see what kind of solar energy potential exists near you please follow this link. To see where Idaho’s solar farms are located, please follow this link. 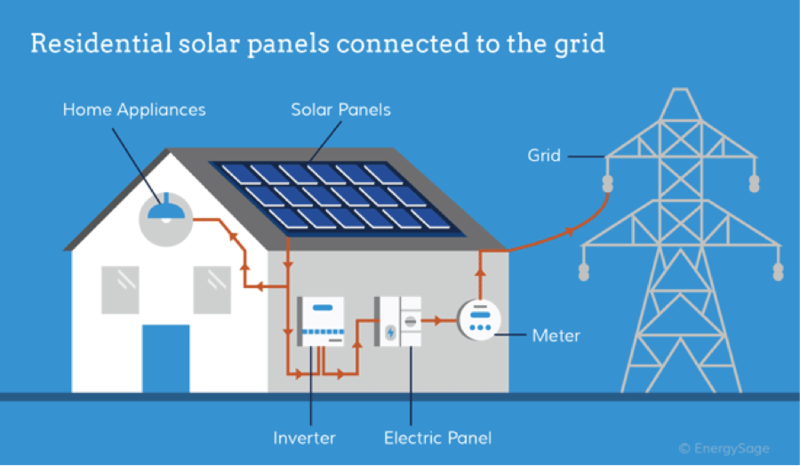 Interested in placing solar panels on your home? The Idaho Governor’s Office of Energy and Mineral Resources offers low interest energy loans up to $15,000 to Idaho citizens and up to $100,000 to Idaho businesses who are interested in qualifying projects. The North American Board of Certified Energy Practitioners (NABCEP) periodically schedules national solar PV and hot water heater installer certification exams. The website includes an exam study guide. For detailed information regarding qualifications, please visit: http://www.nabcep.org/. The Idaho Division of Building Safety (DBS) safeguards the citizens of Idaho through responsible administration of building and construction-related safety and licensure standards while promoting a positive business climate. 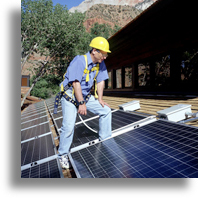 For detailed information on DBS’ electrical program, which includes solar installation, please contact: https://dbs.idaho.gov/ .